Two sunny seasons deserve equally sunny baby favors. Before you start shopping around, here are some bright ideas for your upcoming shower. 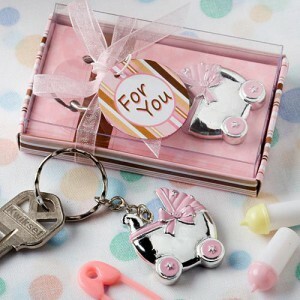 There are countless baby favor ideas for spring or summer showers. The trick is to pick just one! With so many cute options out there, it can be hard to narrow your selection down, but it can be done. In fact, if you really have your heart set on a few different favor types, you can always choose more than one and give a variety to your guests. It will switch things up and your guests are sure to enjoy the versatility. Also, depending on how many people will be attending, giving each guest a different type of favor may work in your favor. When you give unique gifts to each of your guests, they instantly feel appreciated and even more special! 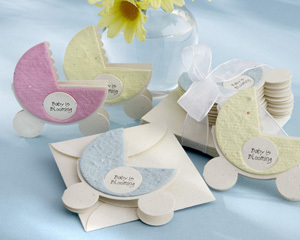 As of late, eco-friendly favors have been some of the most popular baby favor ideas for spring or summer showers. Garden-themed favors are also popular, and they’ve always been classic choices for showers that fall during these seasons. Plantable seed favors are the most cheerful baby favors to give because they produce beautiful flowers that everyone can enjoy long after the shower. Everyone knows what a few simple blooms can do to a yard or a home. Flowers are always uplifting and joyful looking, so you can’t go wrong! 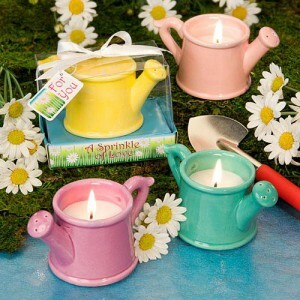 Other fun garden favors you can give include trowels, watering cans, and fashionable gardening gloves. Small watering cans are especially great because you can use them as decoration but fill them with other favors, like baked goods. If the garden theme isn’t for you, another cheerful baby favor idea for spring or summer showers is to give each guest a summer beach bag with fun little surprises inside. Personalized lip balms, towels, sunscreen, key chains, and even sunglasses make great extras to place inside these bags. If you want to make sure they complement your baby shower color scheme, choose bags with pastel colors to match. 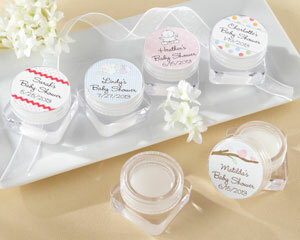 Try any of these cheerful baby favor ideas for your spring or summer shower and add to the seasonal ambience! 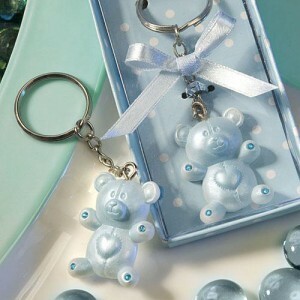 This entry was posted in Eco-Friendly Baby Favors, Spring Baby Favors. Bookmark the permalink.